The battle against climate change will be a race against the clock. Engineers will have to fight on two fronts. The first front is the transition towards a sustainable energy system. The second front is the protection of the population against sea level rise, floods, droughts and heat waves. Video: Time-lapse video showing the relative age of Arctic ice week-by-week from January 1990 until September 2015. Source: NOAA. Animation: Global temperatures from 1850 to 2016, by Ed Hawkins, climate scientist in the National Centre for Atmospheric Science at the University of Reading. They do so in this article in Nature: The collapse of the Antarctic ice-sheet. We can’t afford to ignore the warning signs. The longer we wait, the harder it will be to get climate change under control. After long negotiations, world leaders have agreed on action at the Paris climate summit. Now it’s up to the engineers to develop ambitious plans and innovative solutions. In theory, the area of all solar panels that are needed to power the world is a small percentage of the surface of the earth. In reality, where humans live, the earth is already covered with farmland, houses and industries. Furthermore, solar energy must either be stored during the night, or be supplemented by other energy sources. We need to find more places to host solar panels, wind-farms and biomass production plants. Increasingly, reservoirs, seas and oceans are regarded as the place to be. Many reservoirs in rivers are already in use for hydro-power production and the temporary storage of excess energy. Offshore wind turbines produce electricity for coastal cities. The rough conditions at sea require a robust design of the constructions. 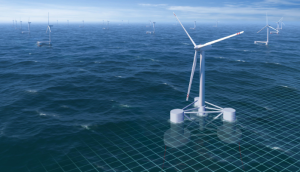 Floating wind-farms are the latest development in the offshore wind industry. Simulation of floating wind turbines, by Bo Paulsen and Niek Bruinsma, Deltares. Yet there is more to explore at sea, such as tidal energy, wave energy and biomass production. Seaweeds and algae grow on solar energy and consume the greenhouse gas CO2. A good combination, as Blue21 indicated in their call for action. The seaweeds and algae can be used to produce biofuels, chemicals and food. Let’s think big about the opportunities at sea. The combination of seaweed farms with wind-farms, former oil platforms and industrial facilities might be very effective. At such an offshore energy plant, biomass can be processed and energy stored, before it is transported to the shore. 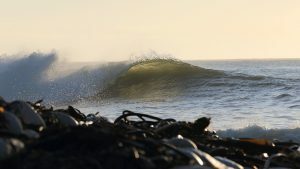 Energy sources of the future: seaweed and waves. Image by Alan Robb. Even if we could switch to 100% sustainable energy overnight, the climate will continue to change, due to past emissions of greenhouse gases. Sea levels will rise, and the frequency of floods, droughts and heat waves will increase. Engineers can design technical solutions to these problems. Coastal cities can build dikes and structures to prevent flooding. Nowadays, smart dikes are equipped with sensors that give continuous feedback on the actual state of the dike. In delta areas, there is a complex combination of factors at play. Sea level rise and land subsidence, floods and droughts, urbanisation and technological progress account for an uncertain future. Adaptive delta planning is a new method to design a roadmap to the future. The roadmap shows the signposts that trigger policy actions. The improvement of a flood defence system will be triggered when sea level, land subsidence or population growth exceed a certain threshold. Video: Adaptive delta planning, by Deltares. Climate scientists have been warning us for decades. The Paris climate agreement made clear that the political leaders are ready for action. More than ever, engineers will have to show what they are capable of and develop sustainable solutions. Climate change is the challenge of our generation. Joost Icke, software manager at Deltares and environmental engineer. Image credit for the picture above this post: Martin Fuchs.